Zurich, Switzerland & Irvine, California – November 22, 2013 – Masimo (NASDAQ: MASI) announced today that ACUTRONIC Medical Systems AG has integrated Masimo SET® Measure-through Motion and Low Perfusion™ pulse oximetry into ACUTRONIC's fabian HFO Neonatal Critical Care Ventilator for improved patient outcomes. The fabian HFO, the world's first dedicated Neonatal Ventilator to offer Masimo SET® pulse oximetry, provides continuous display of newborn oxygenation status. Instead of using two separate devices to collect ventilation and oxygenation patient data, clinicians now simply attach the pulse oximetry sensor via USB interface to the fabian HFO to display oxygenation, perfusion index and pulse rate values on the ventilator's colour touchscreen. This combined technology platform will optimize patient assessments and improve workflow, allowing clinicians to spend more valuable time tending to patients. "The integration of Masimo SET® within ACUTRONIC's fabian HFO ventilator is providing caregivers the ability to better assess their patients' oxygenation status, even during challenging conditions of patient motion and low perfusion," said Roland Hotz, President. 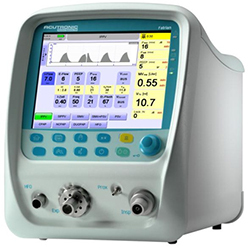 "With our fabian HFO neonatal critical care ventilator, we offer clinicians leading technology on a highly versatile platform specifically designed for the most vulnerable of patient populations." Masimo's President of Worldwide OEM Business & Corporate Development, Rick Fishel stated, "The synergies realized between our companies and products support Masimo's mission to improve patient outcomes and reduce the cost of care by taking noninvasive monitoring to new sites and applications. We are very pleased that Masimo's SET® Pulse Oximetry platform is a key component in ACUTRONIC's new neonatal ventilators." Chow L.C., Wright K.W., Sola A.; CSMC Oxygen Administration Study Group. "Can Changes in Clinical Practice Decrease the Incidence of Severe Retinopathy of Prematurity in Very Low Birth Weight Infants?" Pediatrics. 2003 Feb;111(2):339-45. Clinical Practice and SpO2 Technology in the Prevention of ROP in VLBW Infants. Castillo AR, Deulofeut R, Sola A. Presented at Pediatric Academic Societies Annual Meeting May 5-8, 2007. Oxygen as a neonatal health hazard: call for d�tente in clinical practice. Sola A., Rogido, Marta, Deulofeut, Richard. Acta Paediatrica 2007; 96:801-812.
de Wahl Granelli A, Wennergren M, Sandberg K, et al. Impact of pulse oximetry screening on detection of duct dependent congenital heart disease: a Swedish prospective screening study in 39,821 newborns. BMJ 2009; 338: a3037. Noninvasive Peripheral Perfusion Index as a Possible Tool for Screening for Critical Left Heart Obstruction. Granelli, AD, Ostman-Smith, I. Acta Paediatrica 2007; 96:1455-1459. Screening for Duct-Dependent Congenital Heart Disease with Pulse Oximetry: A Critical Evaluation of Strategies to Maximize Sensitivity. Granelli AD, Mellander M, Sunnegardh J,Sandberg K, Ostman-Smith I. Acta Paediatr 2005; 94:1590-6. Avoiding Hyperoxemia During Neonatal Resuscitation: Time to Response to Different SpO2 Monitors. Baquero H, Alviz R, Sola A. Presented at Pediatric Academic Societies Annual Meeting May 5-8, 2007. Pulse Oximetry Performance Can Affect Caregiver Time Utilization. Durbin CG, Rostow SK. Anesthesiology 2000;93(3A): A556. Goldstein MR, Martin GI, Sindel BD, Furman GI, Ochikubo C, Yand L. SatSeconds Alarm Management Misses Short Desaturations Common to Periodic Breathing and Infantile Apnea. Pediatric Research 2001;49(4):400A/2296. Masimo (NASDAQ: MASI) is the global leader in innovative noninvasive monitoring technologies that significantly improve patient care—helping solve "unsolvable" problems. In 1995, the company debuted Measure-Through Motion and Low Perfusion pulse oximetry, known as Masimo SET®, which virtually eliminated false alarms and increased pulse oximetry's ability to help clinicians detect life-threatening events. More than 100 independent and objective studies have shown that Masimo SET® outperforms other pulse oximetry technologies, even under the most challenging clinical conditions, including patient motion and low peripheral perfusion. In 2005, Masimo introduced rainbow ® Pulse CO-Oximetry™ technology, allowing noninvasive and continuous monitoring of blood constituents that previously required invasive procedures; total hemoglobin (SpHb®), oxygen content (SpOC™), carboxyhemoglobin (SpCO®), methemoglobin (SpMet®), PVI®, and perfusion index (PI), in addition to measure-through motion SpO2, and pulse rate. In 2008, Masimo introduced Patient SafetyNet™, a remote monitoring and wireless clinician notification system designed to help hospitals avoid preventable deaths and injuries associated with failure to rescue events. In 2009, Masimo introduced rainbow® Acoustic Monitoring™, the first-ever commercially available noninvasive and continuous monitoring of acoustic respiration rate (RRa™). Masimo SET® and Masimo rainbow® technologies also can be found in over 100 multiparameter patient monitors from over 50 medical device manufacturers around the world. Founded in 1989, Masimo has the mission of "Improving Patient Outcome and Reducing Cost of Care by Taking Noninvasive Monitoring to New Sites and Applications®." Additional information about Masimo and its products may be found at http://www.masimo.com. ACUTRONIC is a Swiss company developing, manufacturing and distributing high tech ventilation solutions for worldwide NICU's/PICU's, ICU's and Intensive Care Transportation. We are the leading partner for hospitals when it comes to the most critical areas of respiratory care: Neonatalogy/Pediatrics, Jet Ventilation and Difficult Airway Management. Our innovative products simplify the busy clinical routine for caregivers and increase the safety of patients. With over 30 years of experience and together with our global network of clinical experts, we keep challenging ourselves to continuously improve and set standards – like the 'fabians', the most silent neo-ventilation concept in the marketplace today. We strive every day to provide the technologically best solutions that are needed for the most medically challenging patients. ACUTRONIC. Ventilation Beyond Limits. Masimo (NASDAQ: MASI) develops innovative monitoring technologies that significantly improve patient care—helping solve "unsolvable" problems. In 1995, the company debuted Measure-Through Motion and Low Perfusion pulse oximetry, known as Masimo SET®, which virtually eliminated false alarms and increased pulse oximetry's ability to detect life-threatening events. More than 100 independent and objective studies demonstrate Masimo SET provides the most reliable SpO2 and pulse rate measurements even under the most challenging clinical conditions, including patient motion and low peripheral perfusion. In 2005, Masimo introduced rainbow® Pulse CO-Oximetry™, allowing noninvasive and continuous monitoring of blood constituents that previously required invasive procedures, including total hemoglobin (SpHb®), oxygen content (SpOC™), carboxyhemoglobin (SpCO®), methemoglobin (SpMet®), and Pleth Variability Index (PVI®), in addition to SpO2, pulse rate, and perfusion index (PI). In 2009, Masimo introduced rainbow Acoustic Monitoring™, the first-ever noninvasive and continuous monitoring of acoustic respiration rate (RRa™). Masimo's rainbow platform offers a breakthrough in patient safety by helping clinicians detect life-threatening conditions and helping guide treatment options. Founded in 1989, Masimo has the mission of "Improving Patient Outcome and Reducing Cost of Care by Taking Noninvasive Monitoring to New Sites and Applications®." Additional information about Masimo and its products may be found at http://www.masimo.com. This press release includes forward-looking statements as defined in Section 27A of the Securities Act of 1933 and Section 21E of the Securities Exchange Act of 1934, in connection with the Private Securities Litigation Reform Act of 1995. These forward-looking statements are based on current expectations about future events affecting us and are subject to risks and uncertainties, all of which are difficult to predict and many of which are beyond our control and could cause our actual results to differ materially and adversely from those expressed in our forward-looking statements as a result of various risk factors, including, but not limited to: risks related to our assumptions regarding the repeatability of published studies, internal clinical studies and side-by-side clinical evaluations; as well as other factors discussed in the "Risk Factors" section of our most recent reports filed with the Securities and Exchange Commission ("SEC"), which may be obtained for free at the SEC's website at www.sec.gov. Although we believe that the expectations reflected in our forward-looking statements are reasonable, we do not know whether our expectations will prove correct. All forward-looking statements included in this press release are expressly qualified in their entirety by the foregoing cautionary statements. You are cautioned not to place undue reliance on these forward-looking statements, which speak only as of today's date. We do not undertake any obligation to update, amend or clarify these forward-looking statements or the "Risk Factors" contained in our most recent reports filed with the SEC, whether as a result of new information, future events or otherwise, except as may be required under the applicable securities laws. Masimo, SET, Signal Extraction Technology, Improving Patient Outcome and Reducing Cost of Care by Taking Noninvasive Monitoring to New Sites and Applications, rainbow, SpHb, SpOC, SpCO, SpMet, PVI, rainbow Acoustic Monitoring, RRa, Radical-7, Rad-87, Rad-57,Rad-8, Rad-5,Pulse CO-Oximetry, Pulse CO-Oximeter, Adaptive Threshold Alarm, and SEDLine are trademarks or registered trademarks of Masimo Corporation. The use of the trademarks Patient SafetyNet and PSN are under license from University HealthSystem Consortium.